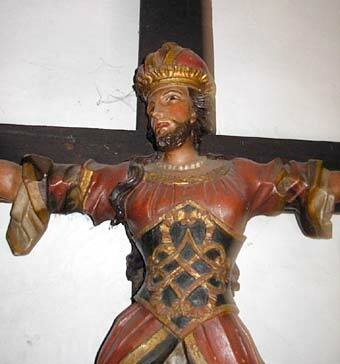 How Saint Wilgefortis Came to be: The Saint of Bearded Ladies | GenderBen! If you know of Saint Wilgefortis, you probably have an uncommonly large knowledge of hagiographies – the biographies of saints. This particular saint gives some interesting but amusing insight into how gendered cultural signifiers have… caused confusion. I should say, Uncumber was her English name, while also being known as Wilgefortis, and various other names such as Ontkommer in Dutch, and Liberata in Italian. One commonality is that her name often translates to mean unencumbered, liberated, or escaped (or similar), as she was venerated by those seeking freedom from hardship. More specifically she has been the patron saint of women wishing to escape from abusive husbands. The story of Wilgefortis goes that she was the daughter of a pagan king (sometimes in Portugal) who had arranged her marriage to another pagan. Because she’d taken a vow of chastity, she prayed to her (Christian) god to make her ugly and undesirable so the marriage would be called off. When she awoke, she had her bushy beard. Her father duly called off the marriage, but also had her crucified. So, presuming that you don’t take this history entirely literally, where did this representation come from? Medieval imagery doesn’t have a tremendous reputation for representing gender non-conformity after all, let alone venerating those who express it. ‘Bearded figure on a cross’ usually only brings one name to mind, and this is no coincidence. It is thought that because Eastern representations of Christ were in, by Western standards, feminine robes or even a dress, when miniature copies were brought over by pilgrims and traders, a narrative sprang up in order to let the image make cultural sense. This argument was first made in 1906 by Hippolyte Delehaye, a Jesuit hagiographical scholar. The Volto Santo di Lucca, or ‘Holy Face of Lucca’, a 13th century copy of the early 11th century original, which contributed to the rise of depicting Christ in long robes. The link between the Holy Face of Lucca and Wilgefortis is underscored further by her name being a corruption of ‘Hilge Vartz’ – or holy face. Gender roles were so rigid that god granting an overnight insta-beard was far more reasonable than ‘men wear different things in other lands’. This statue is in Westminster Abbey in London, specifically in the Henry VII Lady Chapel (fittingly). As one might expect with a process akin to theological Chinese Whispers, the different articulations of a bearded lady’s crucifixion got hashed out in all sorts of different ways. Santa Librada (as represented in the North-Western Spanish town of Bayona) is clean-shaven, and one of nine sisters who were all martyred. Additionally, robes on men somewhere like medieval Italy wouldn’t have inspired the same unfamiliarity as perhaps in more north-westerly contexts. I take some pleasure, however, in imagining a medieval snake-oil salesman having to really think on his feet when put on the spot by a sceptical Bavarian, French, or British peasant over his statuettes.